StartupPeople nasce come progetto di ricerca, ed è il frutto della collaborazione di tre entità: l’Associazione Indigeni Digitali, Intervistato.com e la Nuvola del Lavoro, su Corriere.it. Il primo step affrontato è stato lo sviluppo della mappa: sono state censite e registrate su mappa le startup italiane (attualmente siamo a 212 startup pubblicate). Questo permetterà l’analisi della distribuzione sul territorio e lo studio dei dati in relazione alla posizione dei centri di interesse economico e finanziario. In un secondo step sarà l’analisi della rete sociale dei fondatori, e verrà effettuata dalla Prof. Ivana Pais, ricercatrice in Sociologia dei processi economici e del lavoro. L’analisi permetterà di avere una panoramica molto più approfondita riguardo alla reale natura della rete sottostante l’ecosistema di startup in Italia. Il terzo step sarà effettuato da Intervistato.com: i fondatori che vorranno potranno rilasciare una breve video intervista con il format StartupID, in cui parlare della genesi della startup, il modello di business, la tecnologia che ci sta dietro e le prospettive per il futuro. Le analisi delle reti sociali verranno pubblicate sul blog Nuvola del Lavoro, su Corriere.it, mentre le interviste saranno disponibili sia su Nuvola del Lavoro che su Intervistato.com. "For quite a while now we've been talking about the startup ecosystem in Italy and more and more ofte, inside the main Italian communities, there's talk about creating a web of relations that will allow the system to develop and evolve. Starting from this point, we put a question: at what point are we with the Italian startup ecosystem and most of all, what are the social relationships that have developed on the territory and have allowed this evolution?" StartupPeople is born as a research project, and is the fruit of the collaboration of three entities: the Indigeni Digitali Association, Intervistato.com and La Nuvola del Lavoro, on Corriere.it. 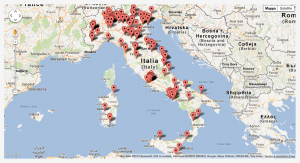 The first step was the development of the map: Italian startups have been registered on the map (there are currently 212 startups). This will allow the analysis of the distribution on the terriory and the study of the data in relation to the position of economic and financial power centers. In a second step there will be the analysis of the social web of the founders, which willl be done by Prof. Ivana Pais, researcher in Sociology of economical and work processes. The analysis will allow to have a much deeper panoramic in what is the real nature of the web underneath the startup ecosystem in Italy. The third step will be done by Intervistato.com: the founders that are willing to, will be able to give an interview for the format StartupID, in which to speak about the genesis of the startup, the business model, the technology behind it and the perspectives for the future. The analysis of the social webs will be published on the blog Nuvola del Lavoro, on Corriere.it, while the interviews will be available both on Nuvola del Lavoro and Intervistato.com.